In a medium bowl combine the butter and cheese. Mix until smooth. 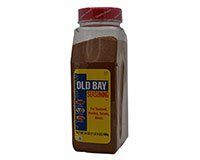 Add Old Bay Seasoning, garlic, and mayonnaise. Gently stir in crab meat. Split the english muffins apart, and spread mixture generously on top. Remove Crab Sticks from freezer, and cut each muffin half into 4 sticks about 3/4 - 1 inch wide. Bake Crab Sticks at 375° for 15 minutes. Serve warm. Uncooked Crab Sticks may be frozen and kept on hand as quick snacks.